Elegant. Sophisticated. Romantic. 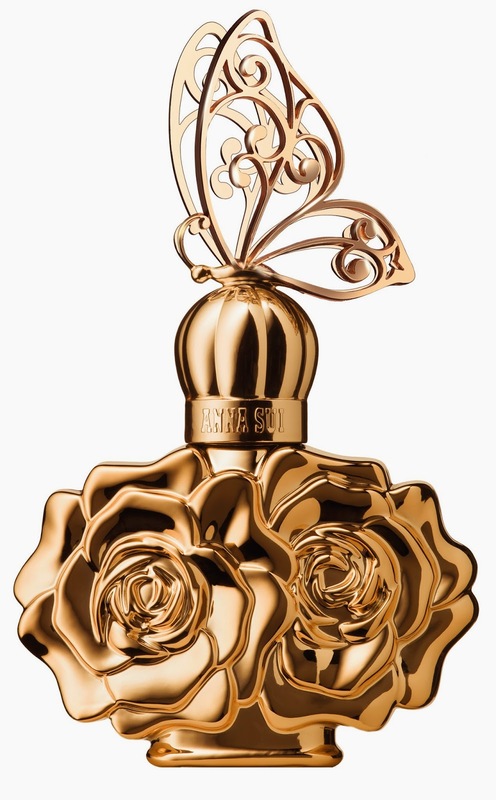 The new fragrance from Anna Sui.....and look at this gorgeous bottle, too?! Fall 2013 saw the awakening of a new spirit at Anna Sui. The dawn of a new fragrance era, under a new partnership with Interparfums. Beginning with the introduction of La Vie de Bohème in 2013, a radiant sunlit fragrance that captured the world of the Romantic Bohemian; a young boho girl filled with light, love and happiness. She is a girl-child woman who lives life on the edge, expressing her freedom and individuality. But at night . . . at night she turns into another girl, entirely. This is La Nuit de Bohème Eau de Toilette, a flanker fragrance that captures all the mystery and sensuality of her heart. Sunset. Last lingering light of the day. Her world turns from a sun kissed realm, to a world of wonder, sensuality, and delight. The golden glow of evening takes on a new meaning for her. The full night descends to deeper innuendos. It’s there in the awakening nightlife, it’s there in the glistening scene, it’s there in the drama of the night. Glamour and femininity come out to play. Sophistication and romance know no end. La Nuit de Bohème Eau de Toilette - A wonderful, magical miracle of the night. Always surprising, the sweet Bohemian changes in a heartbeat, shedding her flowy skirt and floppy hat for something more daring, more exciting, more alluring. When the sun sets, she turns into a mysterious boho-chic. Romantic, a vision of elegance, sensuality and femininity. She is magnetic and uncompromising. And the evening has just begun! Now she is a true creature of the night, sophisticated and captivating. There is still the strong bohemian vibe, but it now goes to glamour. Glamour in the jewels she selects. Glamour in the beaded dress. Glamour in the sensuality she feels. A modern day Scheherazade, a free-spirited Bohemian princess, she sets out to discover all the excitement the night has to offer. Model Gracie van Gastel lounges on golden pillows, and there is an air of golden luminosity all about her. Her gaze meets the camera head-on, an air of confidence, poise, and a heady Romanticism. You can almost sense the warm breeze, the soft air scented with fragrance. Light falls through an archway, it is diffuse and sensual. Is it the rooftop terrace of a Moroccan villa? Is she somewhere in another realm, another century? Is she Scheherazade, spinning 1,001 tales? “The New Bohemian Luxury” sums up the tale . . . provocative, powerful, and alluring. Inspired by the swirling, graceful flow of the Art Nouveau movement, of Aubrey Beardsley, Alfonse Mucha, Gustav Klimt, and Toulouse-Lautrec, the carton is both decorative and extravagant. Embossed with black and gold filigree against a gold shield, the Anna Sui signature butterfly holds a position of importance. This is repeated on the flacon cap, where the butterfly alights in shimmering gold, shinier than the brightest sunlight. The flacon is like a beautiful bouquet of roses, decorative, enchanting, and fun. La Vie de Bohème Eau de Toilette conveys a power that nothing else has. One of elegance and sophistication. Luxury and femininity. There is an air of mystery about it, a seductive allure that captures the heart and stirs the senses. Welcoming the night with open arms, she dances into it, aware of her flirty, girly charm. And the notes are as delicious as they are mysterious, a Floral-Woody-Fruity scent that is redolent of glamour, lavishness, and extravagance. It is all a prelude to the night. Opening with the fizz of Champagne Citrus and Midnight Blackberry, the fragrance deepens to Gilded Lotus Flower, Rose Petale™ and the lengthening play of evening with Sunset Oud Wood. As a final finish, it plays out with Cedarwood Heart, Haitian Vanilla Orchid, Indonesian Patchouli, and Golden Amber Resin. A gilded, glistening fragrance of pure gold.